Blue markers are unique registered World Migratory Bird Day events! Click on the Blue Markers to see descriptions of the events that will celebrate WMBD, and contact information about how you can reach them and get involved. 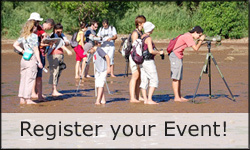 Get ideas from other events, get involved and register your own World Migratory Bird Day Event! Green markers are about this year's theme: Migratory birds and people - together through time! Interesting and inspiring locations and examples relating to cultural, economic and environmental connections between migraotry birds and people. Register a WMBD event to raise awareness about migratory birds, and the need for their protection. Celebrate the relationship people have with migratory birds in your area and receive WMBD posters and stickers to support your event.